I am cheating a little here when I bring in the wonderful NEW series of Father Brown starring Mark Williams in the title role – and excellent he is too. Why this is not on at a peak time I just do not know. However the reason that I can include this reference is the fact that in the Fifties there was a film version starring Alec Guiness as Father Brown and his adversary here was Peter Finch. Alec Guiness as Father Brown – 1954 film version. Five years after their collaboration on the Ealing classic, Kind Hearts and Coronets (1949), Alec Guinness and director Robert Hamer reunited for this teasing adaptation of GK Chesterton’s first Father Brown story, ‘The Blue Cross’. Purists may balk at the manner in which the sleuthing priest has been altered slightly in the transition from page to screen, but this remains a fascinating battle of wits that engagingly balances humour and suspense, while also deftly dispelling ideas about the Catholic Church’s supposed detachment from ordinary life. 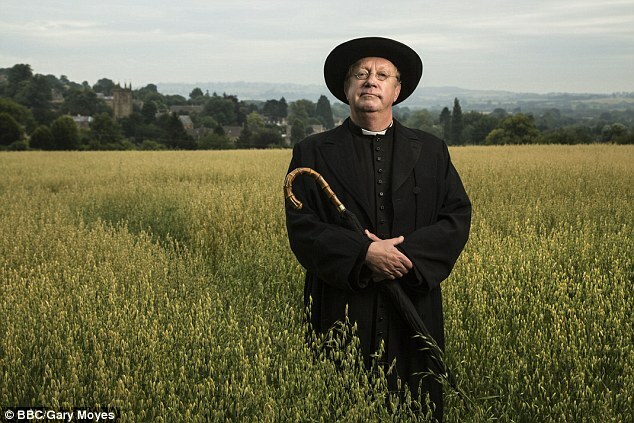 Below: MarkWilliams as Father Brown – Wonderful New BBC TV Series – Don’t Miss It !!! Father Brown (BBC1) returned for a third series, with an episode every afternoon for the next three weeks, and this time he was uncovering a Soviet spy team in the Cotswolds. It’s a sign of how good this production is that the plot in the first episode on Monday never felt like a spoof. Actor Mark Williams fills out the role with a combination of delicacy and slapstick. He isn’t clumsy, or socially inept. Visiting a young couple to offer his condolences after their friend was murdered, he sat with his teacup balanced on his knee, a gesture that seemed to reassure them that he wouldn’t intrude for long into their grief. Even if you’re not a fan of murder mysteries, these 45-minute dramas deliver entertainment with their glorious Fifties sets. Sir Alec Guinness is considered one of the finest actors of the twentieth century, known for his ability to portray a wide range of characters. Alec Guinness was born in London in 1914 to Agnes Cuffe, an unmarried woman who cared for him in a haphazard manner. She refused to divulge his father’s identity, and he never discovered why the name Guinness appeared on his birth certificate. By the time he was six, the child often was left alone for hours at a time. His mother entered a brief marriage to a brutal man who was hated and feared by young Alec. The boy’s only release from the misery of poverty and neglect came when he was sent away to school. As a teenager, he discovered the enchantment of the theater. This “constant interest in religious matters” led the young Guinness to attend Presbyterian services for a time, but the attraction did not last. He wrote in his autobiography that it had never even crossed his mind to step inside a Catholic church. He said his “tolerance for Catholics, unless one personally knew them, was limited to the sympathetic, although condescending” view. Guinness left school at eighteen and went to work as a copywriter for an advertising agency. He no longer thought much about religion, believing it just “so much rubbish, a wicked scheme of the Establishment to keep the working man in his place.” He flirted with Communism by distributing Marxist/Leninist literature. He visited Quaker meetings, investigated Buddhism, and had an interest in tarot cards. Guinness’s career as a copywriter was a failure, so he turned to the stage, realizing an attraction he had since childhood. Success came soon. He was playing Hamlet at the Old Vic when an Anglican priest visited him in his dressing room. The priest complained that Guinness was blessing himself incorrectly in the play. This encounter turned out to be a step back toward Christianity. On a terrible night during World War II, when London was under a Luftwaffe attack, Guinness sought shelter at Rev. Cyril Tomkinson’s vicarage. He was concerned about his wife and their young son, who were in a rented cottage in Stratford-upon-Avon. Over a glass of claret, the Anglican cleric gave Guinness a copy of St. Francis de Sales’s Introduction to the Devout Life and advised him always to genuflect before the altar. Guinness had no idea what was meant by the “Real Presence,” but with bombs exploding around them, it did not seem the appropriate time for discussion. Guinness returned to the Anglican faith and often bicycled in the dark of winter mornings to receive communion in a country church. His friendship with Tomkinson had reduced his anti-clericalism but not his anti-Romanism. It took Father Brown to begin that process. Shortly thereafter, Guinness’s son Matthew, age eleven, was stricken with polio and paralyzed from the waist down. The future for the boy was doubtful, and at the end of each day’s work on the film, Guinness began dropping in at a little Catholic church on his route home. He decided to strike a bargain with God: If God would let Matthew recover, Guinness would not stand in the way if the boy wished to become Catholic. Happily Matthew recovered completely, and Guinness and his wife enrolled him in a Jesuit academy. At the age of fifteen, Matthew announced that he wished to become Catholic. Guinness kept his end of the bargain with God: He readily agreed to the conversion. Sir Alec Guinness died in 2000 at the age of eighty-six, grateful to Chesterton’s Father Brown, who led him by the hand into the Church, and to a young boy’s recovery, which sealed a bargain with God.